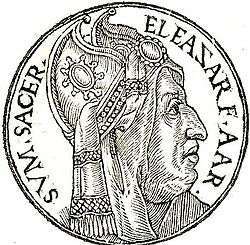 Eleazar (pronounced /ɛliˈeɪzər/; Hebrew: אֶלְעָזָר, Modern Elʻazar, Tiberian Elʻāzār; "El has helped") or Elazar was a priest in the Hebrew Bible (or Old Testament), the second Kohen Gadol (High Priest), succeeding his father Aaron after Aaron's death. He was a nephew of Moses. Eleazar played a number of roles during the course of the Israelites' wilderness wanderings, from creating the plating for the altar from the firepans of Korah's assembly, to performing the ritual of the Red Heifer. After the death of his older brothers Nadab and Abihu, he and his younger brother Ithamar were appointed to the charge of the sanctuary. His wife, a daughter of Putiel, bore him Phinehas, who would eventually succeed him as Kohen Gadol. According to Samaritan sources, a civil war broke out between the Sons of Ithamar and the Sons of Phinehas - which resulted in the division of those who followed Eli and those who followed High Priest Uzzi ben Bukki at Mount Gerizim Bethel (a third group followed neither). Likewise according to Samaritan sources, the high-priestly line of the sons of Phinehas died out in 1624 C.E. with the death of the 112th High Priest Shlomyah ben Pinhas, when the priesthood was transferred to the sons of Itamar; see article Samaritan for list of High Priests from 1613 to 2004-the 131st High priest of the Samaritans is Elazar ben Tsedaka ben Yitzhaq. Eleazar is commemorated as a saint in the Eastern Orthodox Church on September 2, and as one of the Holy Forefathers in the Calendar of Saints of the Armenian Apostolic Church on July 30. According to proponents of the Documentary Hypothesis, the Elohist (E) document uses "Eleazar" as the name of the son of Moses (ref. Exodus 18:4). This figure is more commonly referred to with the name Eliezer. Eliezer is also the name of two other minor biblical figures. ↑ Perry, Simon (2005). Resurrecting Interpretation (PhD Thesis). Bristol Baptist College: University of Bristol.